Thursday, October 7, 2010 \PM\.\Thu\. I was provoked by Tito’s recent post with a great cartoon on the economy. Like him I am greatly concerned about where the U.S. Dollar, our economy and country are headed. This post is related to an earlier post that Christopher Blosser and I co-posted on the Austrian School of Economics. Let me state from the beginning that I am neither an economist nor a certified financial planner. My opinions are worth the value of the cyber ink you are now viewing. It seems clear to me though that our economy is heading into a double-dip recession and possible depression, which is actually calling it what it is. I don’t see how the current policies and actions of the Treasury Department and Federal Reserve are helping the common man. The rate of interest for savings is so minimal now and for the foreseeable future that it can be compared to the sand under the ocean, not the raft-boat on top of the waves. Therefore what can we do to not lose and potentially grow our savings? Thursday, October 7, 2010 \AM\.\Thu\. 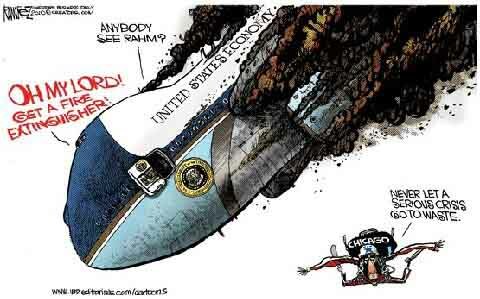 As humorous as this editorial cartoon may be, I still pray each and every day for the economy to improve. This is the worst recession I’ve ever seen in my short time on earth. President Barack Obama, in one of his most dramatic gestures to business, will propose that companies be allowed to write off 100% of their new investment in plant and equipment through 2011, a plan that White House economists say would cut business taxes by nearly $200 billion over two years. The proposal, to be laid out Wednesday in a speech in Cleveland, tops a raft of announcements, from a proposed expansion of the research and experimentation tax credit to $50 billion in additional spending on roads, railways and runways. But unlike those two ideas, both familiar from Mr. Obama’s 2008 campaign, the investment incentive would embrace a long-held wish by conservative economists that had never won support from either Republican or Democratic administrations. It would cost $680 billion dollars over 10 year. This is far greater than the cost of extending unemployment benefits to those out of work, something the Republicans opposed vigorously (the unemployed do not fill their coffers). It gets worse. Nearly all of the benefit goes to the richest 1 percent, those making more than $500,000 a year. Even more than this, 55 percent of the benefit goes to a mere 120,000 people – the top one-tenth of 1 percent of all taxpayers. Doing the math, that comes to an average $3 million tax reduction to those lucky enough to sit at the helm of the income distribution. It is indeed the preferential option for the super rich. This would be troublesome at the best of times, but in the current economic climate when so many struggle to get by, it’s simply immoral. I can see where Minion is coming from on this, but it seems to me that his position here (aside from being contrary to the views of most economists) is contrary to other things he’s written on the desirability of fiscal stimulus. Is the Means of Production an Obsolete Idea? Sunday, May 9, 2010 \PM\.\Sun\. The “means of production” (which may be defined, roughly, as consisting of capital goods minus human and financial capital), is a central concept in Marxism, as well as in other ideologies such as Distributism. The problems of capitalism, according to both Marxists and Distributists, arise from the fact that ownership of the means of production is concentrated in the hands of the few. Marxists propose to remedy these problems by having the means of production be collectively owned. Distributists want to retain private ownership, but to break the means of production up (where practicable) into smaller parts so that everyone will have a piece (if you wanted to describe the difference between the Marxist and Distributist solutions here, it would be that Distributists want everyone to own part of the means of production, whereas Marxists want everyone to be part owner of all of it). Tuesday, May 4, 2010 \PM\.\Tue\. Consistent life ethic proponents have long argued that the pro-life movement must view a wide variety of issues within the pro-life filter; that is, it can be a pro-life vote to help the poor and working class just as it can be a pro-life vote to overturn Roe v. Wade (although it is not necessarily given the same weight). An example of this is Planned Parenthood’s recent expansion in Michigan. The nation’s largest abortion business will add another clinic in the state, this time in Oakland County, within the next two years. This clinic will offer a range of abortion services. What’s curious is the rational for opening a new clinic in one of the worst economies in years. “Over the last couple of years, we’ve been getting calls that go, ‘I’m pregnant, we don’t have health insurance, my husband isn’t working and we can’t afford another child.’ These calls have become routine for us,” says Lori Lamerand, executive director of Planned Parenthood of Mid and South Michigan.